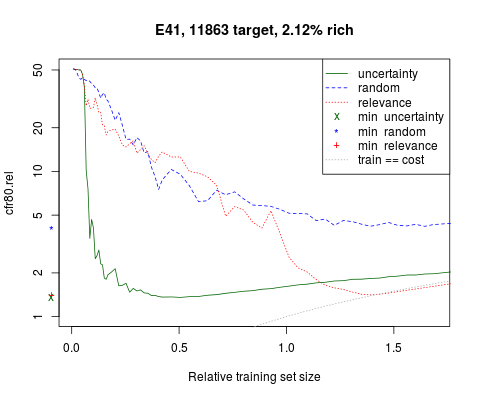 In this post, I am going to evaluate three selection methods—random, uncertainty, and relevance—by the total review cost required to achieve a target recall. For simplicity, I’ll assume that every document costs the same amount to be labelled, whether in training or review. I’ll set the target recall level at 80%, and refer to the cost metric as cost for recall 80 (cfr80). (Cormack and Grossman refer to the same measure as “80% recall effort”.) A run consists of a certain amount of training, followed by review to the depth that achieves 80% recall. The total cost of a run is the training set size plus the review depth. A sequence of (potential) training iterations defines a set of runs, each of which switches from training to review at a given iteration, and each of which has its own cost. The run with the lowest cost is the one with the optimal point of switching from training to review (that is, the optimal training set size). The cost of the set of runs can be represented as a curve; the minimum cost is then the lowest point in this curve. One could also continue training until target recall was achieved in the training set alone, as in continuous training; this strategy is particularly attractive for the “relevance” selection method. An interesting question, then, is if the cfr80 achieved by relevance selection under continuous training is the minimum cfr80 for its run set. Each training sequence begins with a randomly-sampled seed set. For the uncertainty and relevance selection methods, random sampling continues until at least one relevant document enters the training set, at which point we switch to the appropriate selection method (for random selection, of course, random sampling continues throughout). As with previous experiments, the RCV1v2 dataset with its 103 topics is used again. 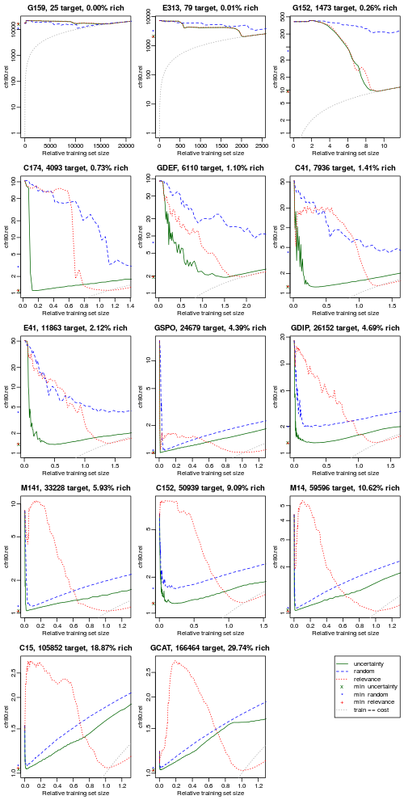 As implied by the finite population scenario, training and target sets are not held distinct; instead, I take 700,000 of the 804,414 RCV1v2 documents as the single, undifferentiated collection. (I’m holding the remaining 104,414 documents in reserve for experiments on sampling and estimation.) The classifier is Vowpal Wabbit 7.4, with logistic loss, a learning rate of 2.0, and a single pass. Training iterations are by steps of 100 to 2000; then of 200 to 5,000; then of 500 to 20,000; and finally of 2,000 to the end. Let’s begin with the cost curves for a particular topic, Topic E41. There’s a fair bit of information in this figure, so we’ll take things bit by bit. The title provides the richness of the topic, along with the number of relevant documents that need to be located to achieve our target of 80% recall. (This target number is richness * 700,000 * 0.8, with 700,000 being the collection size.) The x axis states the training set size as a multiple of the target size, to facilitate comparison between topics of different richnesses. The y axis gives the cost to achieve 80% recall, again as a multiple of target size. (Note the log scale on the y axis, giving greater clarity to the curve minima.) The absolute minimum of relative cost for recall is 1.0, which would occur if all the documents seen, both in training and review, were relevant. Having understood the figure format for an example topic, let’s look at a larger set of topics.